Quizzing — Instructors can add multiple choice, multi-select, and true/false questions into any video using the Panopto editor. Viewers can take quizzes in the interactive player, and instructors can access real-time reports of all responses.This new feature will be off by default, can be previewed by admin users, and can be turned on for all users via a site setting. 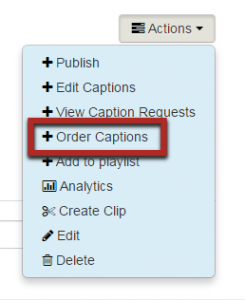 Captions — Users can access Panopto’s machine-generated speech-to-text captions and modify them in the video editor. In addition, users can customize the color, size, and position of captions during playback. Primary Video Switching — For multi-camera recordings, video creators can switch between primary video feeds using the Panopto editor. This eliminates the need for costly video-switching hardware, making it easy to create professional-looking multi-camera events. Enhanced Editing — In June, we introduced the industry’s first HTML5-based video editor. Now, we’re adding the ability to upload custom thumbnails, and to upload and manage slides within the video timeline. For more details about the features in Panopto 5.3, check out our release notes. Saturday, December 17: Panopto Cloud customers will be upgraded to the final build of Panopto 5.3. This release will require downtime. MediaSpace users will be able to apply machine based closed captioning to all previously and newly uploaded video files beginning December 15, 2016. 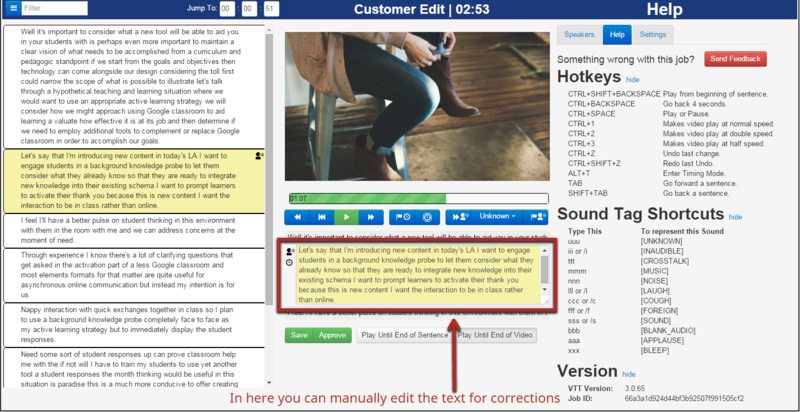 The service, provided by Cielo24, creates editable captions and searchable text with an 70%-80% accuracy rate. Captions need to be edited to meet ADA requirements. The accuracy of machine captions is dependant on the quality of the recording and the speaker’s voice. Typically, the accuracy of machine captions in MediaSpace will be about 70-80%, so it is strongly recommend that you correct the inaccuracies of the captions manually, which can be done through the captions editor in MediaSpace. Note: You can only edit captions if your captions have been already been processed. Look for “Complete” under status to see if they have been processed. 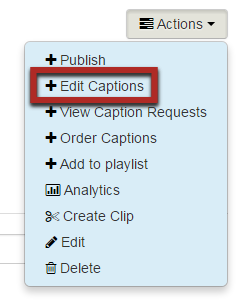 If you see “Complete,” you can launch the online captioning editor by clicking the link. Using the “.” will create a new line for captions. Simply delete a “.” To bring two lines back together. Contact the Information Technology Help Desk for more information about MediaSpace and machine captioning. Kaltura’s REACH captioning service offers both machine-based and human level captioning provided through the company cielo24. Minnesota State will enable the no- cost, machine-based captioning service. Minnesota State will be developing a plan to enable third- party human level within MediaSpace during Spring 2017.